Southwest Glass Products Inc., a Toronto, Ont.-based glass manufacturer, was fined $50,000 for a violation of the Occupational Health and Safety Act after a worker was injured by a conveyor. Get the details here. Arc flash safety equipment can deliver positive, business-enhancing benefits when effectively implemented, while also mitigating risk and reducing costs. But without a clear understanding of the present risks, industry standards and the role arc-resistant motor control centres play in helping contain arc energy, applying technology where needed on the factory floor can be a challenge. Learn more. In addition to 2012 CE Code Update Training, CSA Group provides a wide range of other electrical based training, including renewable energy systems, hazardous locations, and PV installations. Participants can choose from workshop, online format, or the added option of customized onsite training. Learn more about our extensive suite of electrical training courses across the country. Interested in Learning More About CSA's Electrical Community? 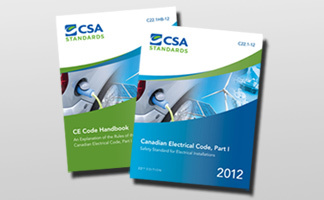 In tandem with the publication of the 2012 Canadian Electrical Code, CSA Group launched knowthecode2012.com - your source for CE Code information, updates and the electrical industry in general. As a central "hub" for concise information on the Code, this space provides videos from experts in the electrical industry, links to regulatory authorities, and is your window to social media connected to CSA Group's electrical community. With over 180 key changes and updates, understanding how to apply the 2012 Canadian Electrical Code to help ensure safe electrical installations is critically important. CSA Group can help. Developed by Code experts and instructors who are experienced electrical professionals and boast extensive familiarity with the Code, you will learn about updated compliance requirements that can help you get a jump on your competition. Register today and get up to $275 in added value, including $50 off additional CSA electrical training (restrictions apply) and a CSA exclusive "Code Calculator" ($40 value). For your convenience, 2012 CE Code Update Training is also available online.